My colleague and I both enjoy the window seat, it seems. 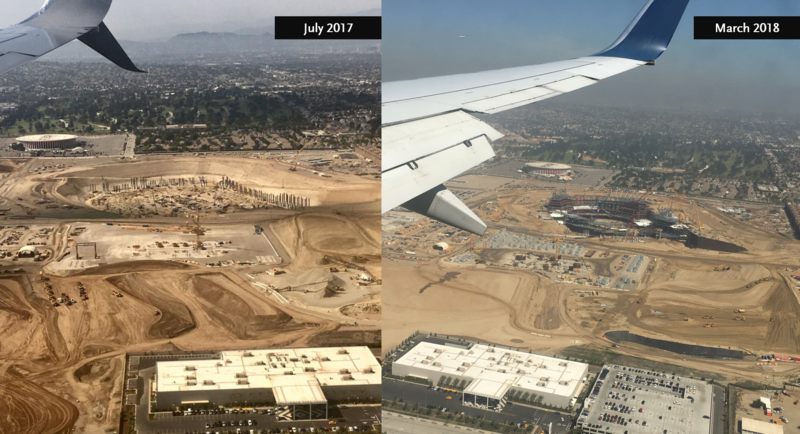 Nice comparison of work on the new football stadium in Inglewood and the Crenshaw/LAX Line trench by the LAX south runway. Photos by J. Isaí Rosa and Steve Hymon. 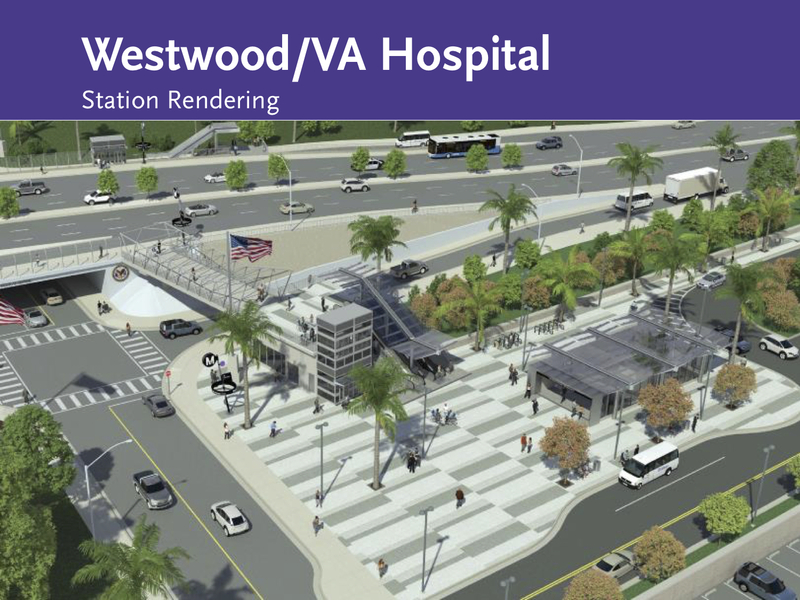 Fresh renderings of the final two stations of the Purple Line Extension at Wilshire and Westwood boulevards and in front of the Westwood VA Hospital. Utility relocations are about to begin — more soon on the blog about that. In the comments on Curbed, there’s some venting about the fact the subway isn’t going further west at this time. The reason: when Measure R was approved in 2008 there was just enough political will and funding to get the subway to Westwood. Could it go further one day? Sure, but money will need to be secured. Wild guess: readers will have much to say about Sepulveda Transit Corridor station locations as planning for that project progresses. “Transit ridership fell in 31 of 35 major metropolitan areas in the United States last year, including the seven cities that serve the majority of riders,” reports the Post in a smart article that covers a lot of ground. Our Metro system was one of those 31. The worry is that more people driving will lead to more congestion, more pollution and more reliance on fossil fuels, among other things. So what to do about it? The suggestions here mostly involve investing in transit — especially buses – to make everyday transit more appealing to more people. Seattle may be a useful example; the area restructured its bus network, added rail and also benefited from tens of thousands of new Amazon employees conveniently working near transit. It’s likely the dream of a 20-minute car commute will live on only in the memories of folks like Alexander. National gas prices. The Western U.S., as usual, pays more than most other states. Source: AAA. This is the time of year that gas prices usually creep upward as the summer vacation season approaches. The photo gallery is based on a new exhibit at the San Francisco Museum of Modern Art, which includes pictures taken from the train carrying Kennedy’s body, pictures taken by spectators and pics from a re-enactment in 2009. How to increase transit ridership? Maybe don’t put a station in the deadzone between a freeway and a VA property that has one of the lowest population densities around. Moving that subway entrance .25 miles further West (relocating that stop, not adding a new one) would have drastically improved ridership and that had to have been obvious to everyone at Metro. These are the decisions that Metro makes and doesn’t justify publicly that really upset your constituents. Did Metro calculate that moving it further West would cost more or would endanger federal funding? If so, tell us! Because otherwise we are left thinking that Metro is incompetent. For the VA Station, Metro should really think about including a pedestrian entrance for the tail tracks, which would be close to Federal/Wilshire. The VA Station is basically inaccessible via bike or foot (without a long circular uncomfortable walk along Wilshire). I’ve never understood the appeal of this station as the VA is very closed off from the rest of West LA and the traffic along this stretch of Wilshire is unbelievable in the afternoon. In the meetings for the Purple Line, the planners stated they wanted to get a station west of the freeway to give people an option vs. that mile of gridlock. Made sense, but back then they talked about putting a station at Barrington or Bundy. Now they are putting it about 20 yards from the 405 onramp and not accomplishing much of anything. Maybe they ran out of money, but Measure M didn’t change anything here. While budget constraint Los exist, if the VA station was built close to San Vicente/Federal, there would be a dramatic increase in potential riders. Having the station on the south east side of Bonsall rules out most pedestrians from Brentwood. It may also exacerbate the deadly merge from the 405 south exit ramp and VA exit off Wilshire westbound. Yes, the hospital has many visitors and employees, but a shuttle bus from there to a station 1/2 mile west (SV) would suffice. As for the future Sepulveda line, there was discussion of a station closer to UCLA (on campus or Le Conte). 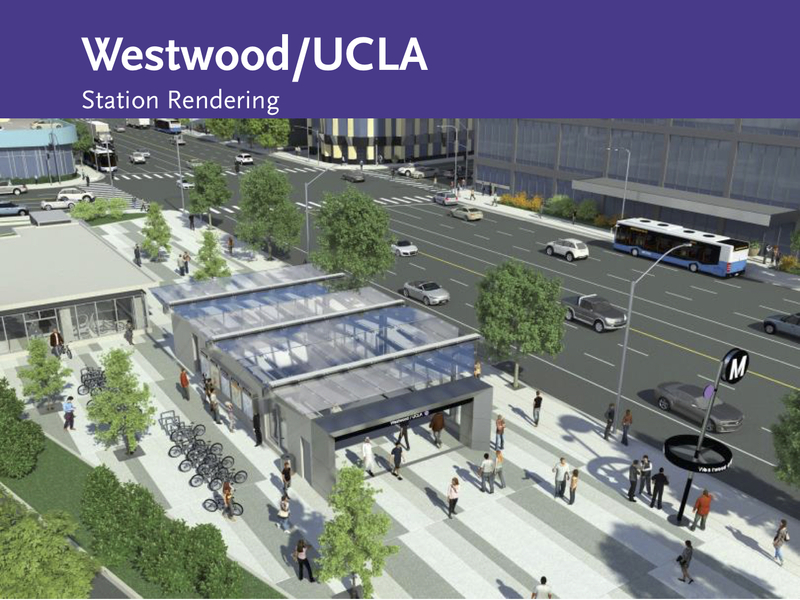 Even though it’s a short distance, a connection stop at Wilshire/Westwood would be necessary. Beyond that, stops at Santa Monica/Sepulveda then the Sepulveda Expo station are logical. The route south from there… anyone’s guess. The VA hospital location is really disappointing. It is in a remote location. And there should have been at least one or two more stations further west on Wilshire at the highrise areas. So disappointing. Steve and Metro staff, please confirm Metro sent an email about changing email service providers and asking notice subscribers to provide personal information. After last week’s spam email I want to double-check. Metro is changing email notification systems on April 30, 2018*. We’d like to keep you up-to-date on the latest news and information from Metro. Yes, Metro is switching to a different email service provider so you will receive a notice if you are subscribed to any of our mailing lists/newsletters. However, if you are unsure about the email you received, please email WebMaster@metro.net and they can look into it. I hate to pile on, but my first reaction from seeing those graphics was how depressing that VA station location is. Couldn’t the renderings at least highlight connections to the hospital itself, the only destination within a convenient walk of the station? This station reminds me of the Century station on the Crenshaw/LAX line. It seemed like an okay idea when the project was planned, and when Metro originally got FTA funding, but now that we’re a decade into the future, and we’re planning a more robust regional transit system, it just doesn’t fit. Unfortunately, Metro is afraid to ask FTA to change their plans even though they have a legitimate reason to do so. I wouldn’t be surprised if their changing travel behavior accounts for more than half of the drop in Metro ridership. There has got to be a way to create a station entrance portal further west without it being too expensive, since apparently budgets are the reason the station couldn’t be .25 miles further west? This still seems odd as I can’t imagine how that would have increased the total cost very much at all, it just doesn’t make sense. I think one of the main reasons the station itself is where it is, is because of the politically correct notion of providing transit access directly to veterans no matter how efficient or not it is for the rest of the population. Since there was only enough money to build one station west of the 405 I’m guessing, the decision must have been Veterans or bust, otherwise people would have lamented that the station was too far west from the hospital thus not properly providing direct access to those who have served, which is obviously a hot button, and sentimental topic for many, and even more so in light of the fact that veterans services in general are often criticized for being sub par in this country. Or maybe it is simply because having the west end of the station box at Wilshire/federal (so that the east end would still provide VA access) would have required extensive excavation directly under VA park property just south of Wilshire and some how that was prohibitive do to the VA being uptight? Either way its an unfortunate and arguably unnecessary result for what could have been a great access point to the rail system in a dense area without it, but now, as currently planned, it just simply wont function all that well for western connections for obvious reasons stated by many. Hopefully this can be remedied in the near future. 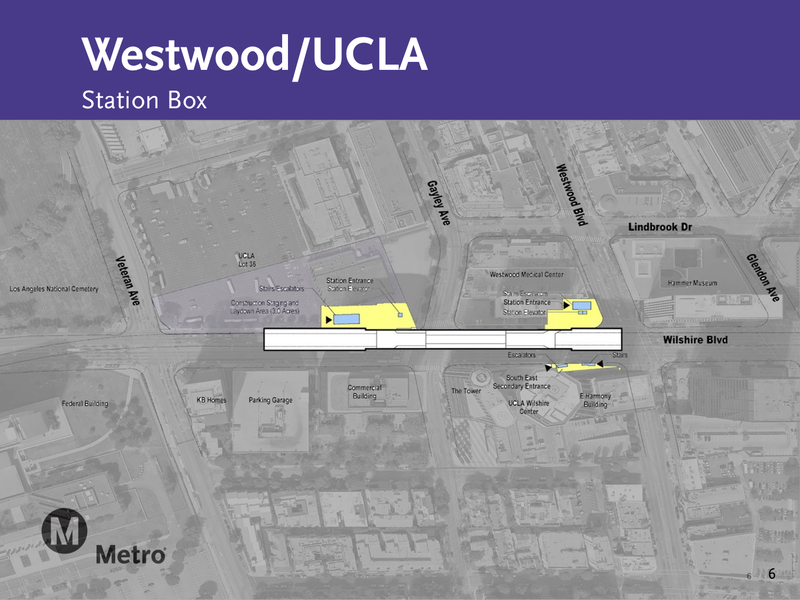 Since this misguided station location looks unchangeable, perhaps Metro can coordinate with LADOT to add a DASH loop bus that runs from the VA station west on Wilshire, up Bundy returning on San Vicente to the station. Another DASH along Santa Monica Blvd from Centinela to Sawtelle (through the VA to the station) would probably see good ridership. Metro regularly looks at first/last mile transportation options. Hopefully this doesn’t get overlooked for this station. More likely the local connecting services will be operated by Santa Monica Big Blue Bus. Also, I assume Metro is planning a huge park-n-ride lot at the VA station to capture traffic from the Valley, Santa Monica and Malibu. There is no parking planned at any of the Purple Line Extension stations. Metro’s first/last mile team will be conducting a study for connections to stations in sections 2 and 3 of the project. Is there any formal response from Metro about the location of the VA stop and it not being slightly further west? As you can tell, there is pretty much universal disagreement with this decision from the public. I don’t have a formal “response” as this was something ultimately decided during the project’s environmental studies, which were completed in 2012. There was also considerable public outreach before and discussion in the two years prior to approval of those studies. The long story short is that there was neither the funding or the political will for the project to go beyond Westwood although extensions all the way to downtown Santa Monica were studied. Everyone is certainly entitled to their opinion about the station location and I certainly encourage folks to air their opinions here or anywhere else. But the location has not changed. And here is the Metro staff report explaining only two alternatives (one ending at Wilshire/Westwood and the other at the VA Hospital) were affordable under the agency’s LRTP at the time. In the run-up to Measure M and in discussions with officials in the area, there was talk about adding funding to extend the subway further west but ultimately other projects prevailed in getting funding. Most notably, those funds went to accelerating section 3 of the subway, the Sepulveda Transit Corridor which proposes ExpressLanes on the 405 and high-capacity transit between the Orange Line and LAX, the Crenshaw/LAX Line northern extension, the Airport Metro Connector station at Aviation/96th and Lincoln Boulevard bus rapid transit. Some additional context that may be useful: times have changed. The extensive support for the subway project from the Metro Board and public was not always so extensive. Some feared the subway project would consume too much Measure R funding, leaving few dollars for other parts of the county. As the studies for the subway began in 2007, the Expo Line was gearing up for heavy construction — and some thought Expo and the PLE would be too close to one another (one under Wilshire, the other south of Pico and then on Colorado) west of the 405. And just getting Measure R approved in 2008 with the subway as the largest project funding-wise was a big lift, considering just a decade earlier L.A. County voters had approved a ballot measure not to use current sales tax money for subway construction, fearing mismanagement and cost overruns. I’m not dumb enough to say that the decision to end the project at the VA satisfied everyone — obviously not. But at the time it probably was the best that could be done given the realities of funding and politics. I agree with a colleague who likes to say the project fulfills a moral imperative to bring better transit to our nation’s veterans, which is not a trivial thing. There are certainly challenges ahead in terms of building ridership with those who live west of the future subway terminus. I don’t believe those challenges are insurmountable although I certainly believe they need, as always, public scrutiny and commentary. Steve: Thanks for the correction. I expect that team will have its hands full planning for all the Ubers, Lyfts, Breezes, Lime Bikes, Birds, and all of the other new mobility solutions coming to that part of town every day. Does Elon Musk plan to install a portal for his tunnel at the VA? How about a hyperloop station? Thanks for the background. It’s nice to see many of us are in good company as people have been disliking this station location for 8 years. 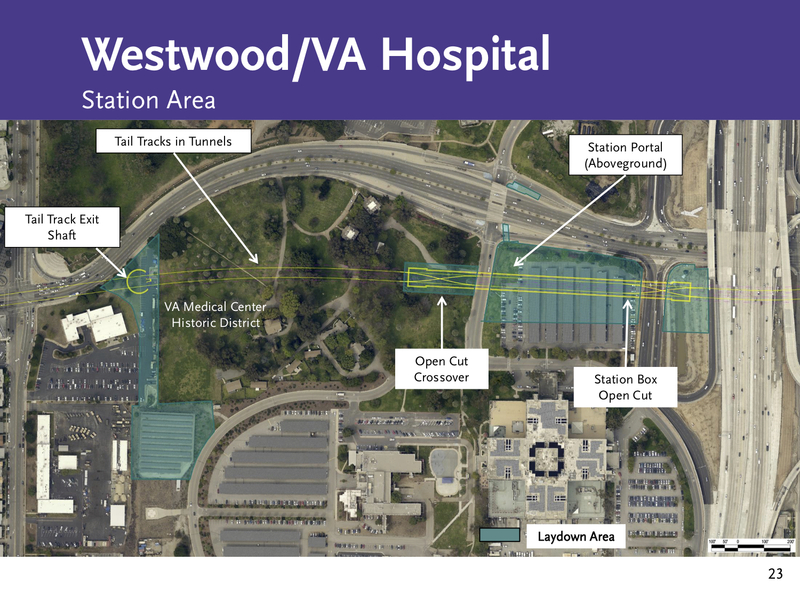 Seems to me that there are good reasons for the placmeent of the Westwood/VA station that are not being disclosed. One is that it raises the value of adjacent land for development. Another is that the federal property there is the natural place for the National Guard etc. to assemble and create a base camp in case of disaster/mass uprising in the city. I recognize these are to some degree exclusive but not entirely. It’s a big property. Thanks Steve, appreciate the response above re: VA stop. But I think your focus on the question of whether there should be a stop west of the 405 vs. no stop at all vs. multiple stops west of the 405 is off the mark. While people understand that there wasn’t funding for multiple stops west of the 405 and everyone wants a stop west of the 405, the frustration concerns where that single stop is located. As far as I can tell, Metro only studied a stop on the north or south side of Wilshire at the VA, but didn’t study what an alternative (not additional) stop at Barrington would have looked like. It seems like Metro never explored an option west of the 405 that didn’t include a stop in the middle of the VA. Even the reader poll you link to ignores this as a possibility. The only “no” option is do not build the station, it is not in the right location. There was no alternative for “no, it is not in the right location but build it in another location”. The quote from Carter Rubin in that 2010 Source post sums it up perfectly–this station is so much more inaccessible than any other station. Given that fact, it is disappointing that Metro appeared to not have considered alternatives for that one stop west of the 405. I understand that decision was made a long time ago, but it is still disappointing. And I would add that it is also disappointing that nothing can be done to change that absurd result now.